The draw to spend our summer in Ireland at Athlone Institute of Technology may seem obvious. Being able to work with novel sports such as Gaelic football and hurling while learning new methods adopted by other parts of the world was hardly what any of us imagined before this opportunity presented itself. Our preceptor, Dr. Siobhan O’Connor did a wonderful job facilitating our experience by including not only clinical placements but also providing guest lectures on topics that are relevant to the profession. 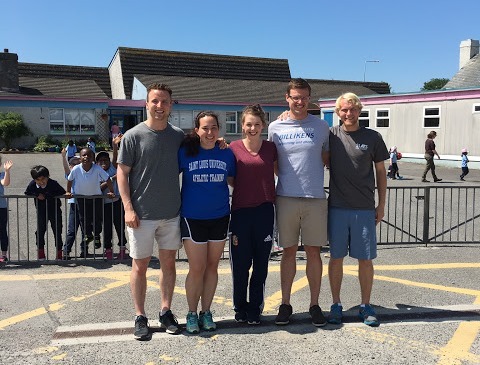 Time at our clinical site was spent between AIT athletics, county level Gaelic football and hurling, and researching fundamental movement skills in adolescents. Throughout these clinical experiences we were given all the freedom we wanted in the evaluation and treatment of athletes, often practicing new techniques on uninvolved limbs while athletic trainers within the program at AIT performed treatments on the injured extremity. Needless to say we were busy. Despite all of the time spent working on practical skills, we all agree that our biggest take away was from the cultural experiences in athletic training and healthcare as a whole. Operating in a rural country with a much different healthcare infrastructure has created a need for accessible healthcare professionals. Working in this environment truly helped develop the bond between patient and professional, something we all hope to bring to our athletes back home.